On Saturday Morning (6 January 2018), Donald Trump met with Republican Leaders at Camp David. 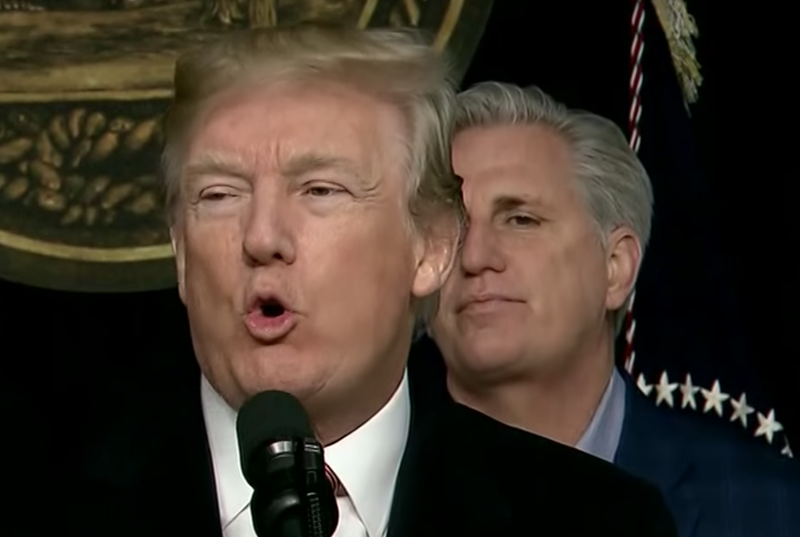 What follows is a nonverbal analysis of House Majority Leader, Kevin McCarthy's reaction to the President's answer to a journalist's question regarding the possibility of Trump meeting with Robert Mueller. 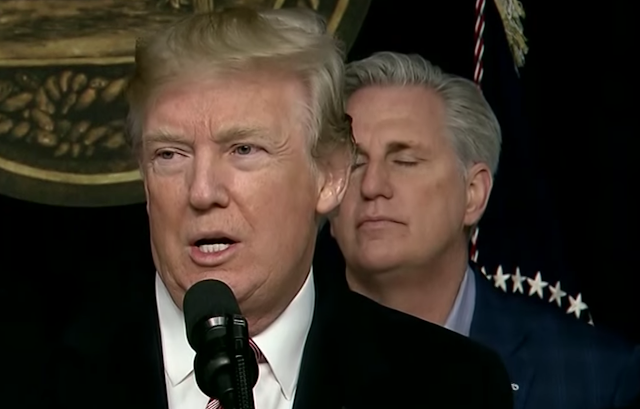 Just after the first time President says, "... there's been no collusion ...", Kevin McCarthy (who is standing in back of Donald Trump's left shoulder and partially obscured by his head) displays a rapid series of nonverbal signals (a cluster). 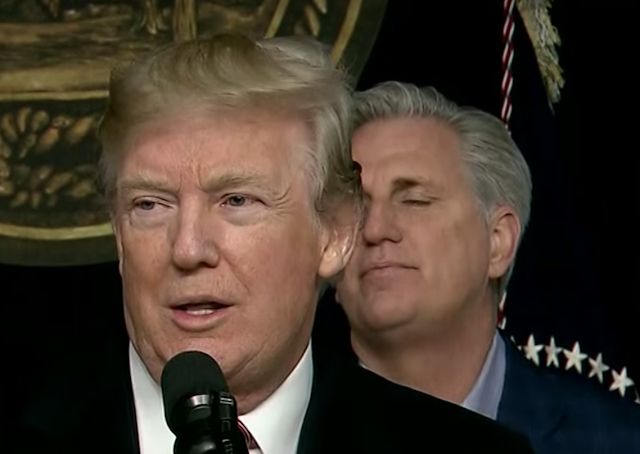 18:24 - Representative McCarthy closes his eyelids for a prolonged duration. 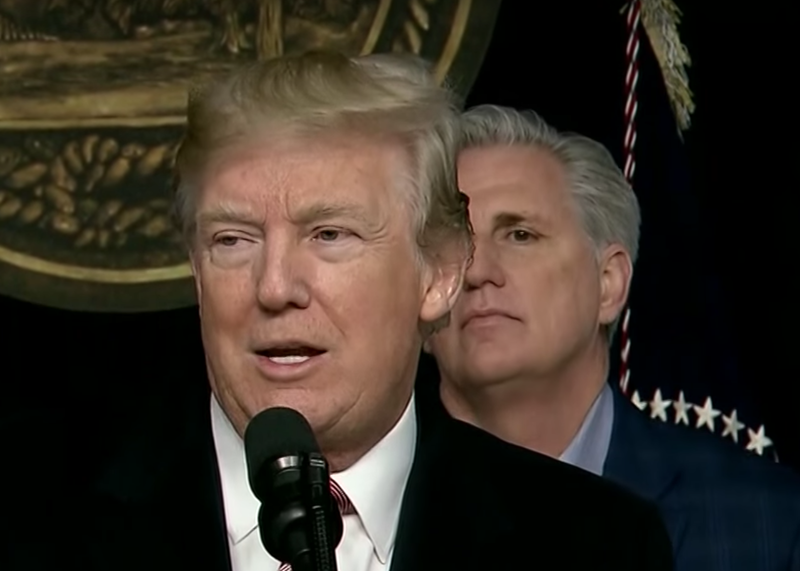 This signifies psychological blocking behavior - the Majority leader's logical brain knows what the President just said - and yet his emotional brain wants to block it out - e.g., "I can't believe he said that!" This represents a form of emotional processing/disbelief. 18:24 - His eyes remain closed (more blocking/disbelief/emotional processing). He also begins to express Disgust. The tilting-backward of his head/neck (in this context) is a Disgust Amplifier. 18:25 - McCarthy's Disgust persists. He then exhibits a Hard Swallow - which betrays his anxiety with the president's statement of "... there's been no collusion ..."
18:26 - 18:28 - Representative McCarthy rapidly bounces on his toes. This further telegraphs his anxiety regarding the President's "No Collusion" statement. What significant nonverbal signal of Donald Trump's did you observe associated with his qualifier of: "... in theory ..."? Summary: The House Majority Leader, Kevin McCarthy is both incredulous about - and feels disgusted toward the President's repeated claims of, "There's Been No Collusion". Moreover, this gives McCarthy significant anxiety.